A polycarbonate template to expediate drum head changes. 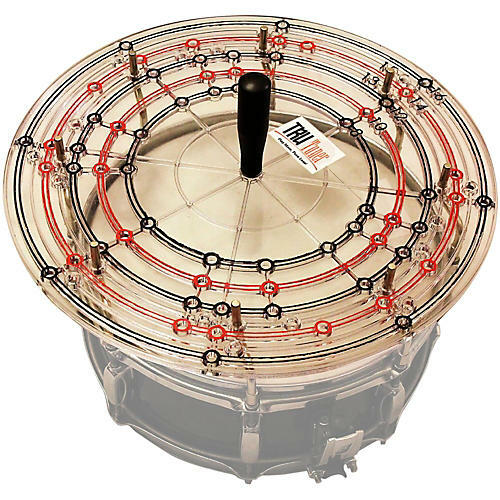 The Rapid Drum Head Replacement System from Tru Tuner is a clear, reinforced polycarbonate disc with 10 chrome-plated keys. The handle compacts for easy transport and the plate is sized to fit in your cymbal case. Colored rings, lined ridges and bumbered start holes simplify the setup and tuning process. for lining up specific drum size. This device works with sizes 8", 10", 12", 13", 14", 15" and 16"on most standard lug patterns 4, 5, 6, 8 and 10 (currently not on 14" and 16" 6 lug). Lifetime warranty.